In an exciting step forward, BCA has managed to make their already trustworthy Float Packs even more efficient. 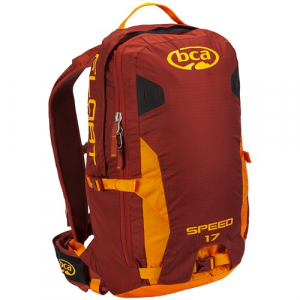 The BCA Float 2.0 17 Speed Airbag Pack is 20 percent lighter than last years model and houses a 30 percent lighter cylinder (sold separately.) The cylinder and any system bits and bobbles are kept in a separate compartment, giving you more room for your extra layers and packed lunch. With an overall lighter look and feel, the BCA Float 2.0 17 Speed Airbag Pack is more like a freestyle pack and less like the heavy duty equipment needed to keep you safe.